Suzi McAlpine | The Art of Leadership | 10 Reasons to Download The Leader's Digest App – Your Pocket Coach! 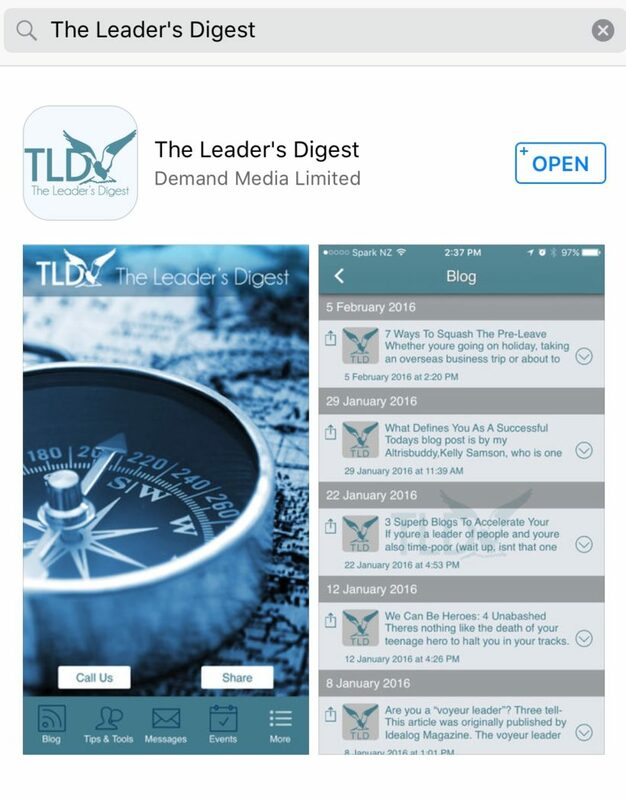 10 Reasons to Download The Leader’s Digest App – Your Pocket Coach! The Leader’s Digest App is now available! This app has been a labour of love for over a year now. The idea for the app came about after feedback from my amazing clients and readers about how isolating and challenging leadership can be at times. The reality is, leadership can feel a bit like running a marathon in the dark. Having an executive coach is one way to combat this. But it can tough when you’re doing it on your own every day. You asked for more support, to help you through the gritty daily stuff – and the app is designed to do just that. What’s more simple than having help on your phone or tablet, right? 1. Its free. And we all can do with some free stuff every now and again. 2. It gives you one place to store all your leadership bits and bobs. As well as The Leader’s Digest tools, there’s a space for you to put links to articles, tips you come across and your own notes. You can bookmark your favourite posts and keep them all organised in one place. 3. It covers useful leadership topics – information you need on a daily basis as a leader – such as ‘Awesome Coaching Questions’, ‘How to Challenge Effectively’ and even ‘How to Run an Effective Job Interview’. Plus loads more. 4. It has a ‘Monthly One-on-One’ template. You can download and adapt it for one-on-ones with your team members, along with information about why these are essential for high performance. 5. It provides tips on how to effectively lead change (and let’s be real, who is not leading through change these days?). 6. It’s your very own pocket coach! The app gives you answers to your leadership problems, tools to improve your skills and the latest leadership trends, all from the comfort of your smartphone or device. 7. You can give it to every new manager who joins your team, as part of their induction. 8. Did I mention it’s free? 9. It links into the The Leader’s Digest Blog, so you get notifications of the latest blogs as they’re published, and easy access to old ones. 10. You can impress your colleagues by casually referring to the fact you have downloaded New Zealand’s first leadership app – and encourage them to follow one of the world’s leading leadership blogs (and therefore look like you’re up with the play). So dilly dally no more. Do yourself (and your team) a favour and download this free leadership resource today. All you need to do is go to App Store and type in The Leader’s Digest. IT’S THAT EASY. The app will come up at the top of the page, then you just hit the download button. And, once you have downloaded it, please give us your feedback. Because feedback is ALWAYS welcome. How can we improve it? And what would you like to see more or less of? If you love it, please leave a review on the App Store! This is really helpful and I’d be super grateful if you can take 3 seconds to do so. 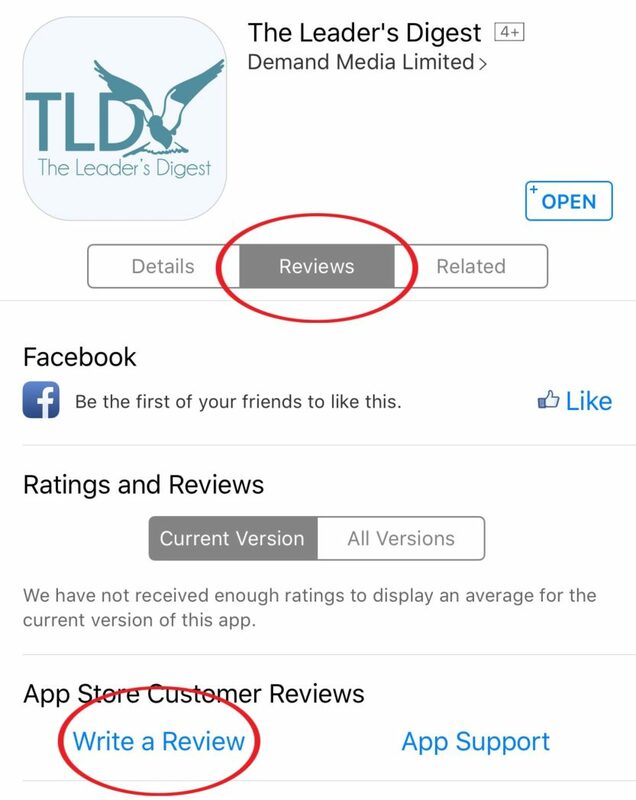 Just click on The Leader’s Digest App, then click on the ‘Reviews’ tab, then click on ‘Write a Review’ at the bottom. If you would prefer to get in touch with me directly, please feel free to send me an email at [email protected] Or, leave your comments below. I hope you enjoy it – and I look forward to hearing your thoughts!